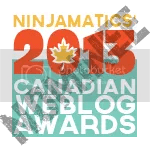 ← Make Jujube Tea, Not War. Roasting a chicken (or any bird) can be intimidating. 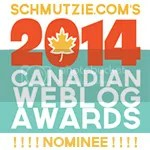 I know you’ve heard all the horror stories of dry meat, oven fires and overcooked/under-cooked nightmares. 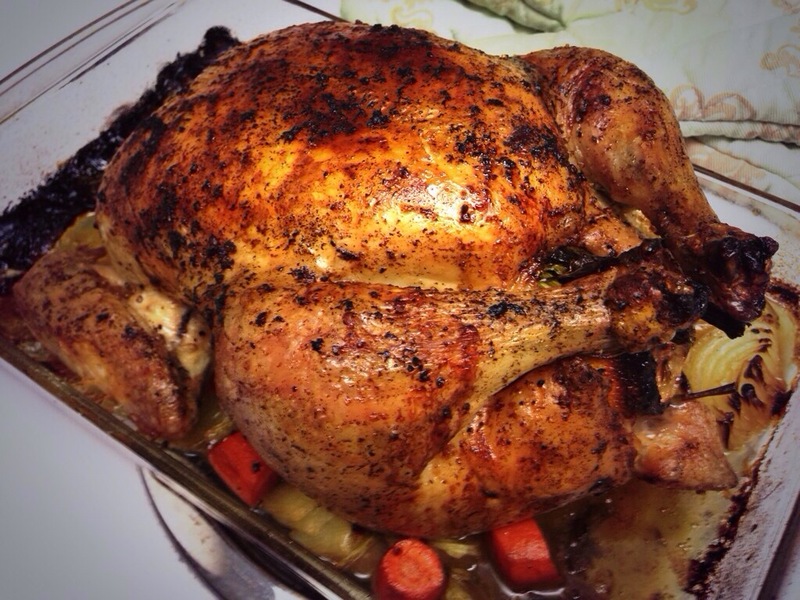 For these reasons, I avoided roasting my own bird for years. 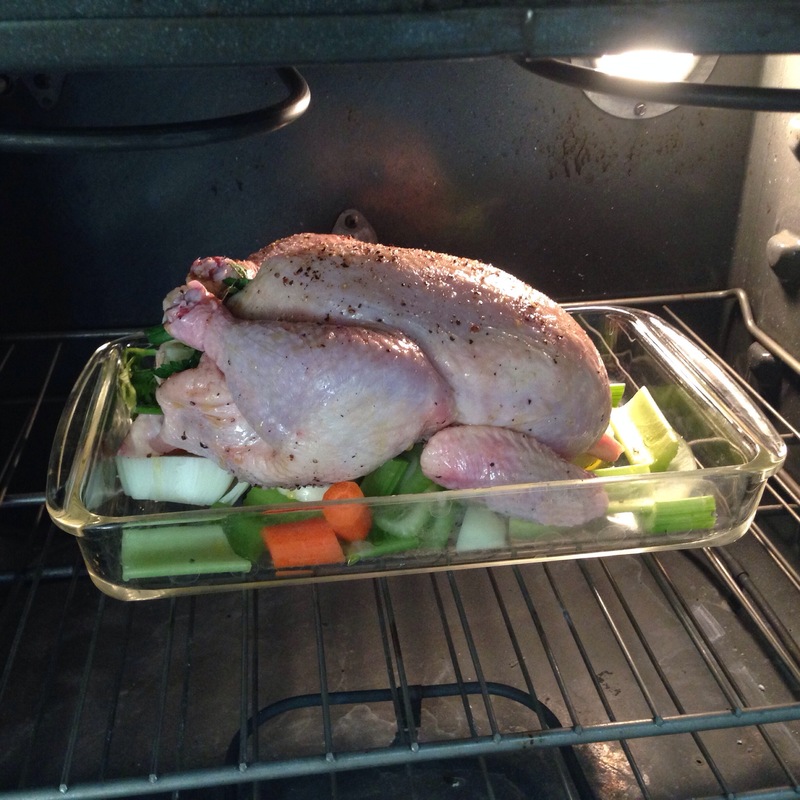 It always seemed like a job best left to roasting experts…because “my bird will never turn out as good as theirs”. 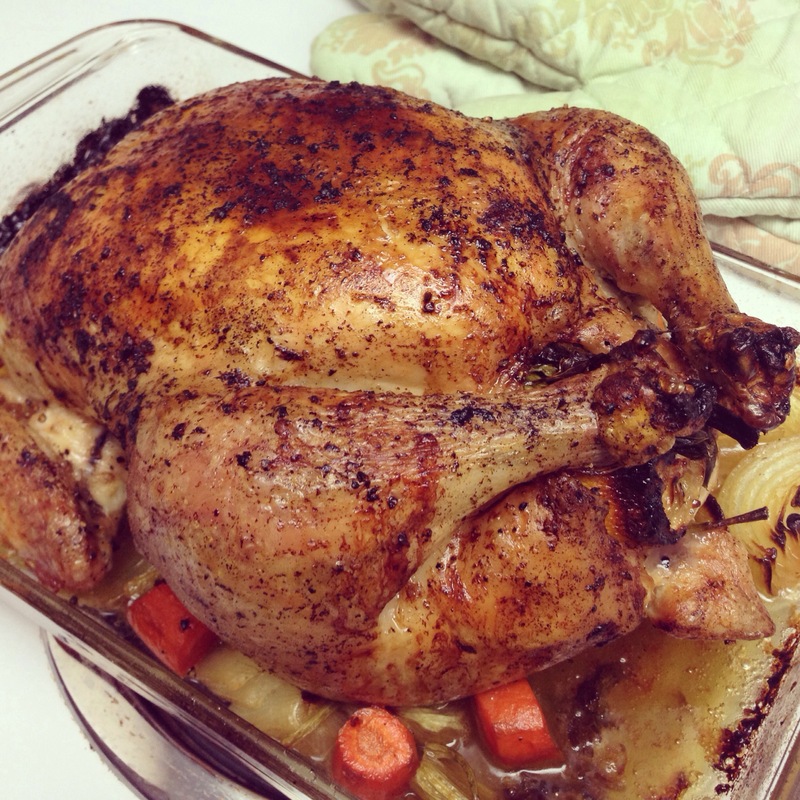 I am posting the recipe I used for a chicken I roasted last week. 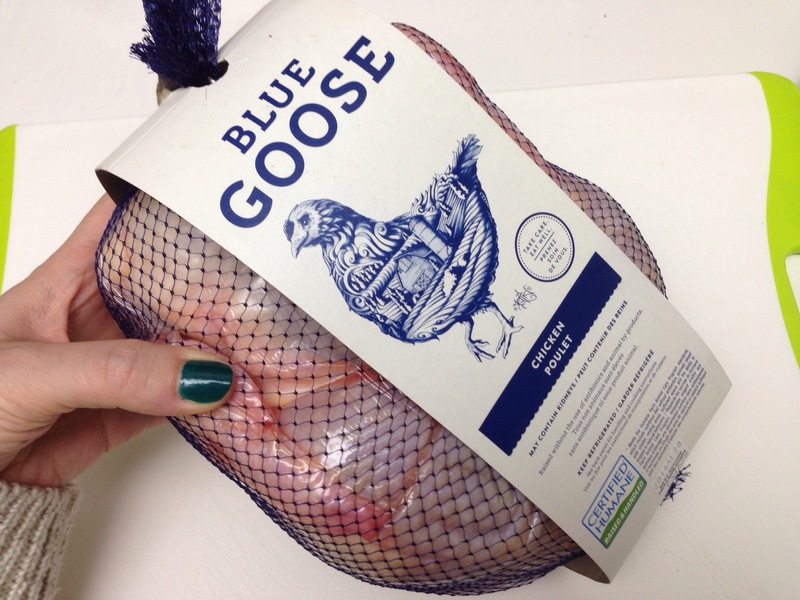 I picked up a Blue Goose naturally-raised chicken from my local grocery store. Blue Goose raises natural and organic chicken, cattle and fish and believes in the humane processing of animals. It was my first Blue Goose purchase and it was DELICIOUS, so I have to say that I do recommend this company. You are what you eat, so you should eat well and buy meat that is raised and processed in the right environment. Follow these simple rules and you’ll be sure to make a yummy chicken. 1. Always pat raw chicken dry with paper towel before seasoning. You need your chicken to be dry, not wet! 2. Fill the bottom of your roasting tray with cut vegetables. A combination of celery, onions, garlic and any root vegetables. Your chicken will sit over this bed of veggies to keep it from sticking to the bottom of the tray, allow room for drippings and even cooking. Not only will the veggies add some flavour to your bird, they will cook in the drippings which will make a lovely gravy/sauce. 3. Stuff the chicken with veggies, fruits and herbs for extra flavour. Fresh herbs work best and can include rosemary, parsley, sage, oregano, bay leaves…any herbs can work! Citrus fruits like lemon or orange can add a nice flavour twist. If you don’t have fruit or herbs lying around, just some onion and garlic will do. Use more of the same veggies you lay in the bottom of the tray! 4. Keep your seasoning simple. I season generously with kosher salt and freshly ground black pepper and drizzle a little olive oil over top. That’s it! 6. 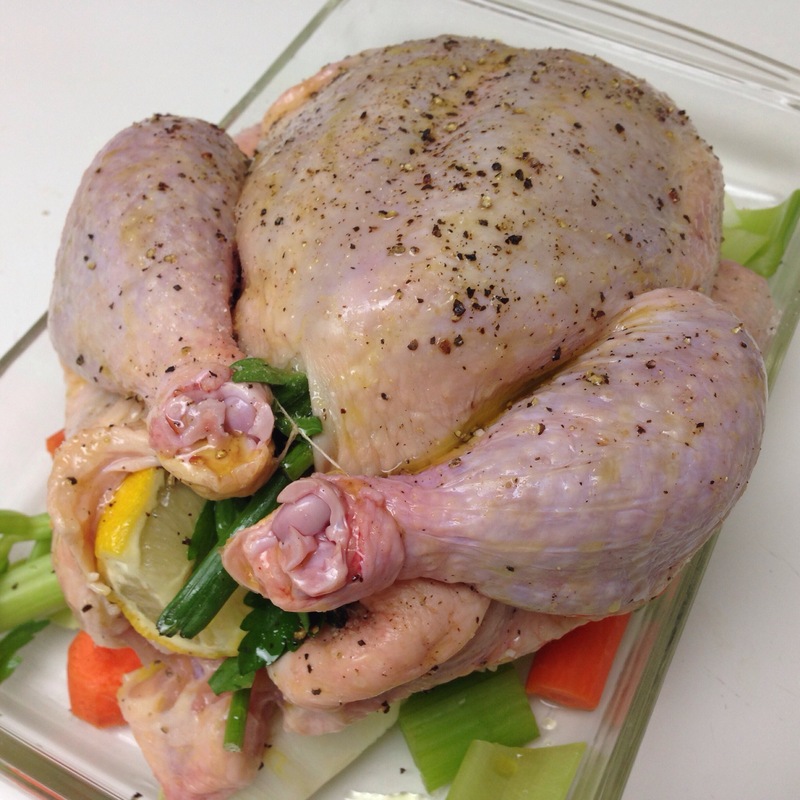 Cook an average sized chicken (about 3 to 3.5 pounds) for about an hour and fifteen minutes at 400 degrees. 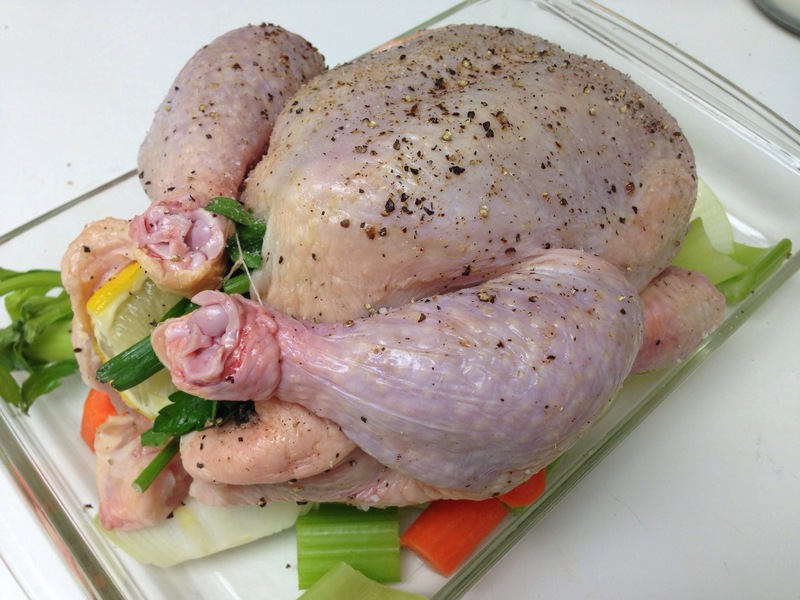 After cooking, cover chicken in tinfoil and let rest 15 minutes before carving and serving. 2. 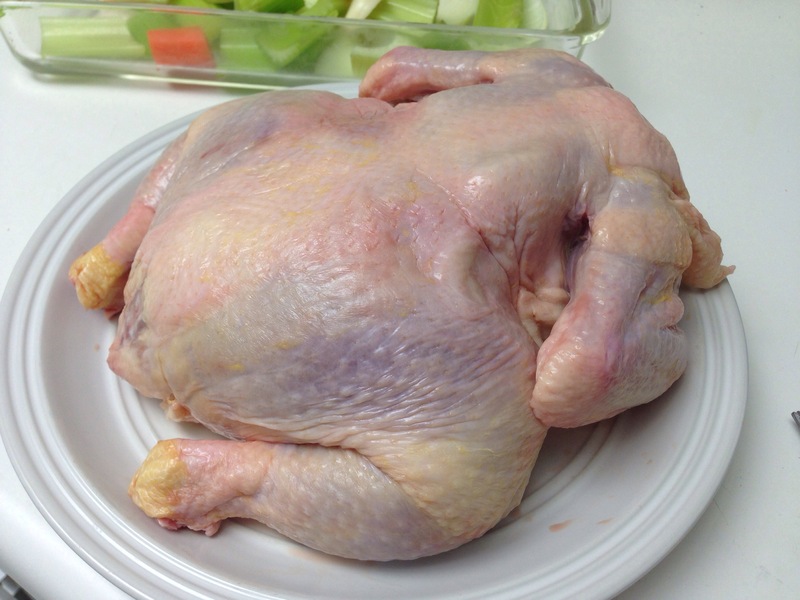 Take chicken out of packaging, place on a clean plate and pat dry with paper towels. There is no need to wash your chicken. *Never use the same plates, cutlery, knives, cutting board etc. for raw and cooked meat. Once your chicken is cooked, use clean dishes and utensils! 3. Wash, peel and chop all veggies as indicated in the ingredients. 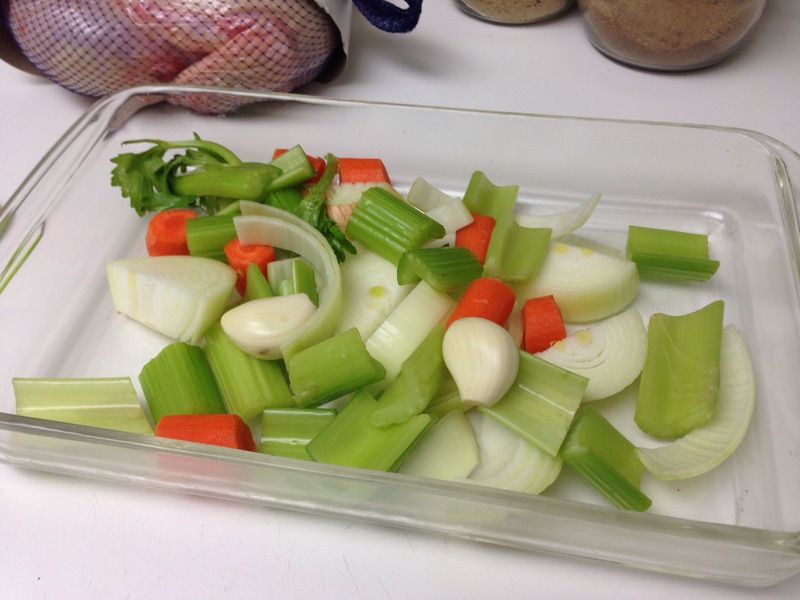 Toss the quartered onion, garlic, celery, carrots and any other root vegetable(s) you might want to add into the bottom of the roasting pan. 4. 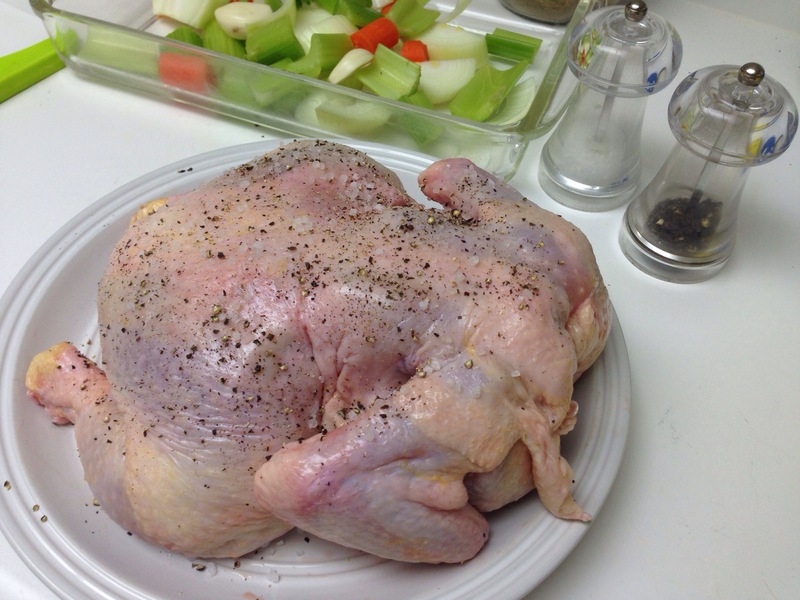 Season chicken generously with kosher salt and black pepper. Top and bottom of bird. 5. 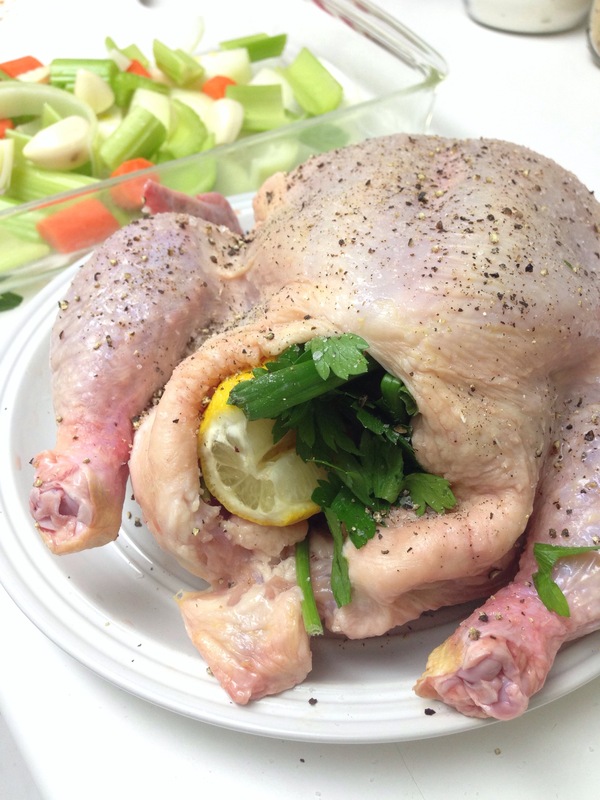 Squeeze the lemon halves over the chicken and then stuff the cavity of the bird with parsley, garlic, green onion and the lemon you just squeezed. Try to cram as much as you can in there. 6. Place chicken in roasting pan, breast side up. 7. Tuck the wings under the bird so they don’t burn while cooking and tie the ends of the legs together with kitchen twine or string. 8. Drizzle olive oil evenly over the chicken. I like to finish it off with a little more salt and pepper. 9. Put tray in oven on centre rack uncovered. * Add a bit of water to the tray if the veggies start to burn or look dry. This will also create more liquid for basting. 11. Skin of chicken should golden brown and crispy. 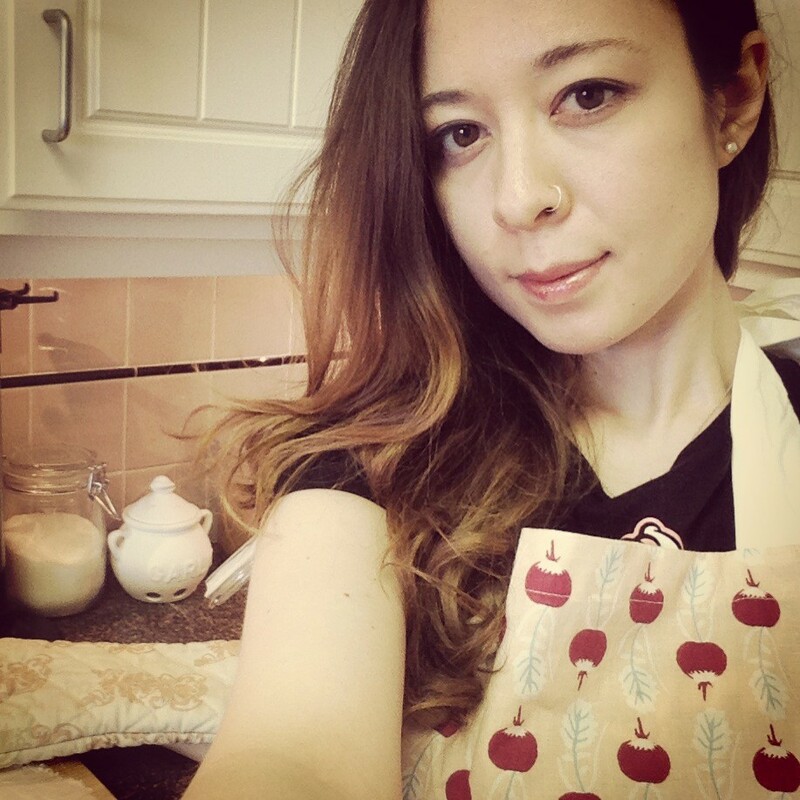 Remove from oven, cover with tinfoil and let rest for 15 minutes. You could use the drippings from the roasting pan to make gravy by transferring to a small saucepan, adding a bit of water and simmering. Add flour to thicken the sauce if necessary. You can leave the veggies in for flavour, or even puree them into the gravy. Season with salt and pepper to taste. Send me pics of your roasted birds and let me know how it went! I’m glad you tried it! 🙂 Isn’t it so easy!? So happy to hear the family enjoyed! Your bird is beautiful, Vanessa! Keepin it simple is so underrated! Thanks Francesca! 😀 You know it! Simple (almost) always wins! Roast of Chicken.yum yum with wine.. Oh i missed it very much. I’m a total dummie when it comes to cooking and was searching for a simple chicken recipe. This is great! !